Is thre an Android version? Do i need to backup my lessons? How do I backup my lessons? How do I import backup data? Why isn't Spliced sync'd with the cloud? Will it be? How is Spliced different from a word processor? how can i add a pdf directly onto my lesson plans? Spliced keeps all of your lesson data in one efficiently organized file. By organizing the data by both entry type and visibility (i.e. there are "Lesson", "Unit" and "Curriculum" visibilities) the app can streamline how you enter your data and which types of data are shown in each type of interface. The result is a quickly-accessible and compact database for you to view your data and for documents to be created on the fly. A desktop supplement is in the works! It will run on any computer with Java installed. I understand some people like to get really detailed or just like to sit at a desk and get in the zone, so having a much larger screen and keyboard are helpful and a desktop version is necessary. The "desktop version" will enable you to create a lesson and export lessons to the app; it will not be the "full" version. I think it will be ready by the end of October. There most likely will be and Android version by fall of next year, if not sooner. Right now, I'll be honest with you, I'm pretty burned out from making the iOS version but I also gotta admit – Java (the Android development language) is my jam. I'm a Java teacher, for crying out loud! So even though I don't have an Android device (yet), enough people have asked that I feel pretty comfortable saying that this is going to get done soon. 1) First create a lesson component that allows images to be uploaded. 3) This will add multiple, separate images. If you want one component with multiple images, you have to use another app to edit the images and create one single image. For example, you might have three equations that you want students to solve and you want all three to appear on the same slide. This can be accomplished if all three are uploaded as a single image. 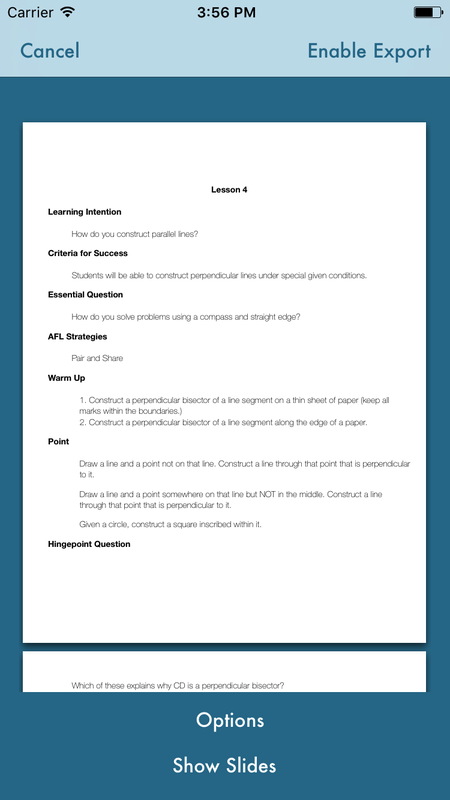 Quick Build is a function designed to cut out an extra step each time you create a new lesson plan. Typically, building a lesson plan in Spliced is two steps: (1) touch the component you want to add (2) enter data for the component. But if a lesson has eight or ten distinct components, you would have to perform each of these tasks eight or ten times. Quick Build cuts out the first task. In Lesson View, touch the Quick Build icon and Spliced will automatically take you through all of the Quick Build steps, sequentially. You can set which components are "Quick Build Components" by touching the Gear. The app is in "Quick Build" mode, as indicated by the "End" button at the bottom. Touching "Save" will move to the next component in the sequence. First, a word on saving and reliability: Spliced automatically saves your data immediately after you edit or add anything. Second, during the process of debugging the app before its release, I have never lost data after a crash. But that's not to say Spliced is 100% reliable. You should backup your data simply because that's what you should do whenever you work with computers. You just never know exactly what can go wrong. Even while I want to assure you Spliced is reliable, I really, really hope you back up your work periodically. There are three ways to back up your data. In all three cases, save a backup by emailing it to yourself, air-dropping it to your computer or by using any other number of options that appear when you touch "Export." To back up all you lesson data, touch the gear, touch "Backup" (this takes you to the Backup Screen) and "All" is the first type selected. Just touch "Export"
Determine what you want to backup and navigate to the parent component. For example, if you want to back up a unit (as is shown in the diagram) you would navigate to the Class View (where all the units are displayed.) Now go to the backup screen. Touch "All". A picker will appear and the selection "Unit" is available. Select this and you will be able to select which of the units in that class you want to back up. Similarly, to back up a few lessons, navigate to a unit first, then go to the backup screen. Go to the Backup Screen. "All" is the first type selected. ouch "All". Choose "Components". Your components are ready to backup. Touch export. 1) Open whichever app you are storing the backup on. In this case, I sent the backup to my email. 5) If you are importing units or lessons, you can tap the button under "Import as..." to select where you would like the import to go. Tap "Done". If you do not see your content immediately, refresh the view by going "back" and then reopening it. *If you have any open tasks (editing components, settings, etc...) the import screen will not open until you return to the Class, Unit or Lesson View (main menu) and navigate from there. There are a few reason why, by design, Spliced does not work on the cloud. The first reason is that I myself have used many apps that save work on the cloud and I find that syncing multiple devices is very unreliable. I don't like the notifications I get that say "conflicts exist" because I am usually asked to choose between two versions without an adequate comparison of the two. (Github is the exception) Furthermore, if I am having trouble using cloud application developed by large, established companies with some of the best programmers in the world working for them, I seriously doubt I myself, as a one-person, part-time developer, could do a better job. The second reason is that this is an app for teachers. (If you are a teacher, I don't have to tell you this:) Many schools have unreliable WiFi. The networks get jammed and syncing is even less reliable in a classroom. In my own school, if I don't pull data I need from the cloud before class starts, you can forget about it. It would be better if all my data was always available on my device. Finally, paying for cloud services costs money. There are a few apps for which I am willing to pay annually, but those are few and far between. My favorite apps are apps that are add-free and buy-once-use-forever. I want my app to be something I would buy. It would not be sustainable for me to maintain cloud services unless I chose to require a paid subscription for those services. So that leaves us with the question will it ever be on the cloud? I don't want to say 'no' quite yet because my app is very, very new. I definitely want to remain open to the feedback from Spliced users and respond to what they say they need. If I do eventually offer some sort of cloud syncing, it will probably be through existing cloud services such as Dropbox or Google Drive or iCloud. It would also be an optional add-on, because I think there will always be some people who feel the way I do about syncing data with the cloud. Your school administrator says every lesson needs a "Learning Intention" and a "Criteria for Success." The "Criteria for Success" should also be reflected in your unit plans. For the sake of simplicity, let's suppose those are the only two fields. Also, let's suppose there is a professional development this coming Monday and every teacher is asked to bring in a unit map. With a word processor: You create a file for your lesson plan and type it up. You create a file for your unit plan and open the files for every one of the lessons inside that unit plan. From each of the lesson plan files, you find and copy its "Criteria for Success" field and paste it into your unit plan file. With Spliced: You create two components: "Learning Intention" and "Criteria for Success". You give each field an appropriate visibility at the "Unit" and "Lesson" level. You write each of your lesson plans, filling out the fields accordingly and Spliced creates the unit plan automatically. How do I add content to a document? The checked components will appear in lesson plans. If you are asking this question, it is helpful to understand how Spliced works. Any data you enter is classified as a component of one type or another. The built-in components are "Class" "Unit" and "Lesson". Every other component isuser-defined and has user-defined characteristics. The characteristic that is most relevant right now is a component's "visibility" characteristic. When you create a document at a given level (i.e. Class level, Unit level, Lesson level), every data of a component that is visible at that level is automatically added to the document. So if that was too wordy, the short answer is: in settings (touch the gear), touch the group of components you want to make documents for (Lesson, Unit and Class) and switch "on" (green) those components that you would like to appear in the document. If the data does not appear, then no data of that component type has been created yet. It is not possible to save PDFs directly onto Spliced. However, Spliced gives you the ability to use and access the data from any PDF within your lesson plans; in the form of a link that will open in Safari. 2) In the Dropbox app, tap "Share". 3) Create a shareable link. When exporting, tap "Copy Link". 4) In Spliced, tap the gear icon on the lower left hand corner. 6) Tap the "+" symbol on the upper right hand corner. 7) Name the component. (Here I named mine "PDF") Tap "Manual Entry" and select the type "Link". 8) Tap "Done" and tap "Back" until you exit the settings. Select the lesson into which you want to attach a PDF, tap "+". 9) Select the component you just created, and paste the link into the description. Don't include the prefix "http://". 9) Tap "Save". Now, when you tap the link, the PDF will open in Safari.